Beautiful duplex on a lovely quiet street in London's fashionable Notting Hill! Notting Hill is an area in West London, in the Royal Borough of Kensington and Chelsea. The area is most well-known for Portobello Market (on Portobello Road, unsurprisingly), which runs every day except Sundays, and the Notting Hill Carnival, held every year on the last weekend in August. Two of my favourite smaller London museums are both within walking distance of Notting Hill. Leighton House and Linley Sambourne House are excellent examples of everyday life in the 1890's in London. Any fan of the Victorian Aesthetics Movement in art/books/lifestyle should make one of these museums a must visit!!! Of course, we couldn't talk about Notting Hill without mentioning the film and the BLUE DOOR Released in 1999 and starring Hugh Grant and Julia Roberts, the film did much to promote and raise interest in the area.It was the reason so many shops relocated here and why other long standing ones had to close as the area became more expensive.It really has changed so much in the last 20 years.The area has so many shops and it's a foodie heaven with delis,coffee shops,tea rooms galore! About the Flat: The flat offers our guests plenty of space. The fact that it's split level allows a spacious environment to relax in.The kitchen is fully stocked with all the bits and pieces you'll need to ensure that cooking here will be a delight! Please take the shopping trolley out and stock up on fresh fruit and vegetables for your stay. The market is the place to head for this. There are also some excellent deli's within a few minutes walk. The closest large supermarket is 5 minutes away. After a day out shopping one can simply enjoy the garden and a glass of wine and unwind. The flat also has a power shower within a roomy bathroom. Notting Hill is a great place to visit, from its cafes and restaurants, its market and boutique shops, to its many pubs and bars. It holds much in the way of entertainment, whatever your interest - be it shopping, dining, film, drinking, clubbing or more! Things to do: Notting Hill still has three excellent independent cinemas and I would suggest visiting at least one of them on your visit. The Electric Cinema is closet to the flat and is a must see for any film lover. If you're a lover of music than a visit to the original Rough Trade shop on nearby Talbot Road is a must see! You'll find a vast array of recorded music and their walls of plastered with posters/handbills from the past 50 years of music in London.If Jazz is more up your street than a trip to Honest Jon's on Portobello Road. Books Books Books...yes this area still has some independent shops left. I mentioned that the Travel Bookshop is up for sale..but still trading(This is due to close Sept/2011)(now closed Dec 11). There's the excellent Books For Cooks on Blenheim Cres. Yes, it's all about food here and they also have special cookery evenings and plenty of authors signing their latest cookbook. One can really walk to several places of interest. I walked the entire way into the West End last week...passing several wonderful attractions. The walk did take about one hour and 10 minutes but on a lovely day it made us realise why we love London so much! You can walk via Hyde Park and pass the Royal Albert Hall and the Albert Memorial...and head up to Wellington Arch and straight down Piccadilly into Soho/Covent Garden.One needs to remember to wear comfortable shoes though! If you're booking during the summer season than an open air concert should be on the list of things to do. The flat is very close to Holland Park where one can listen and see Opera in the Park. This park is a pure delight...not as big as the other Royal Parks but it has a lovely Japanese Garden...not to mention the Peacocks and other wildlife. Hello! My name is James and I manage this property for my friend Cynthia Rose, the owner. I have loved in London all my life and this is a great property in an amazing area! The short stroll to the world famous Portobello Market is one of the numerous highlights of staying in Notting Hill.There are numerous cafes and restaurants just a short walk from the flat that cover all tastes and budgets.Every Friday and Saturday walk 4 mins from the flat and browse the stalls of the markets selling everything from vintage clothing,antiques,records,books and just about anything else one can think of. A lovely south facing garden with table and chairs. This 3 bedroom flat was a great deal in a great location, and worked fine for our family. We appreciated the washer/dryer, WiFi, and private back patio. We used the stove a few times and it was easy to use. The drying rack in the bathroom was helpful, too. The street was quiet, and safe. The Grocery Store was in walking distance. Note: fridge is just a mini-fridge, not a full size, so plan accordingly. Improvements: The leak from the shower into the laundry room needs to be fixed (the water dripped onto an electric extension cord—it was scary). Also, there was very little room for our clothes/luggage because all of the drawers were half full with towels and sheets. It was nice to have so many towels, but it would be great to condense those things in a more orderly fashion, so as to allow guests space to put away things in such a small space. It would be nice to also have the book with instructions include information on garbage/recycling. Thank you. I'm pleased you enjoyed your time. The fridge is a standard size here in the UK but I do understand that it's not the standard size in North America, We had our plumber around to look at he leak as soon as it was mentioned and he found that the shower pump needed some minor attention and thankfully this was fixed and there has been no sign of anymore more water in the laundry room.The extension socket was fine too. Thank you for telling us about it.It's a very large flat so I'll ensure there's more room in the closets.The council have changed the days for recycling so as soon as we receive the updated info, it will be placed in the info book. We really try to encourage our guests to be eco friendly and are happy to ensure that any bottles etc are taken to the recycling bank in Notting Hill after guess leave just in case you miss the one day per week when it's collected from outside of the house.I hope to welcome you back to the UK on your next visit. We had a wonderful stay in Notting Hill! The apartment was exactly what our group of 6 was looking for. There were enough beds, towels, etc. and kitchen utensils for cooking. Being inside zone 1 and just a 5-10 min short walk from Notting Hill Gate underground was definitely a plus as well. The neighborhood was very peaceful and seemed to be in a pleasant location, in addition to being just outside the Portobello Road market. James and his team were very friendly and helpful, and were quick to respond throughout the booking process. Being students, we also found the price to be very affordable for the location. I would certainly recommend this apartment to anyone looking to stay in a comfortable and pleasant location within zone 1! Hope to stay here again! Thank you! It's great to hear you really enjoyed your time in Notting Hill. Excellent location, well equipped, warm and cosy. There were altogether six of us (including a child below 2 years old). The check-in was very good as we had someone waiting at the apartment to hand over the keys and introduce us to the apartment. The apartment is excellently located. The nearest bus stop is about 200 m away. This suits us very well as we took the one-day bus pass which costs only GBP5 per adult. The underground station is also not very far, if you prefer to take the train. The apartment is warm, clean and cosy, and it has everything that you need for a family stay. We especially like the bathroom as it is very spacious and warm. We would like to thank James for granting us a late check-out. We were able to go to the street market at Portobello Road on our last day. Highly recommend this apartment to anyone who needs a home away from home in London. Thank you. We try hard to ensure our guests enjoy their stay.I'm really pleased to read that you and your family had a good time.I hope to welcome you back on your next visit to the UK. James and his crew were fantastic - accommodated us a day early and got us in quickly! Thanks so much James and Phil! My husband who was super ill was so very very grateful. Thanks so much, it was great. Thank you. It's lovely to hear you enjoyed your stay in Notting Hill.Items to be recycled can be just left in the flat and we look after it for you, as it's only collected from the street once per week.There are numerous sites around Notting Hill Gate that items can be taken too and I'm happy to do that.I hope to welcome you back on your next visit to the UK. The good: we enjoyed staying here. It was well located to get to the Notting Hill Gate tube stop (5 min walk) which gives you access to the Central, District, and Circle Lines. The flat served as a good base for our week in London. Having three separate bedrooms was nice. Being near Hyde Park and Kensington Palace was also nice. Again, the area was great and the flat is functional. The not as good: Everything is worn and dated. You notice right away that things are worn and that not much sprucing up has been done. We weren't there a lot and basically just slept there, so it was fine. But it's a bit dreary. Also, the upstairs mattresses (the four twin beds) could use replacing. The queen in the bottom bedroom was fine, but the upstairs twins weren't terribly comfortable. Finally: I'll note that for some reason Google maps wants to take you to a different street in a distant part of London. Even our taxi driver couldn't find this on her app and took us to a different location. Had I not tried to find it on my own and looked at the Google Street view, we'd have struggled much more to find it. On a positive note, we took the tube to Heathrow at the end of our week (after taking the Heathrow Express and a taxi on arrival). For £3.40, we were able to take the District line to Earl's Court, make a quick switch to the Picadilly line, and were at Heathrow in about 50 minutes. Easy trip even with our luggage. Thank you. Yes, there is another Lonsdale Road in Barnes(further into SouthWest London, so it's always important to say Notting Hill to any taxi drivers.Goggle isn't always 100 percent with its maps.The flat does get alot of wear and tear with shorter lets and this doesn't help with the place looking abit tired at times. I can assure you that we really care about this flat and perhaps a lick of paint wouldn't go amiss.I do hope it was good value for a large split level flat in a very sought after part of London and I hope to welcome you back. The tube is always the fastest way to the airport.Best Wishes for future travels. We were 3 guys staying for 3 nights and this flat was ideal for our needs. The decor is a little tired but for a flat with 3 separate bedrooms the price was very good value. It is only 5 minutes from The Portobello Road yet we experience no noise and all slept well. All the essentials were there and in good order. The owners agent was very helpful before during and after our trip. Thank you. I'm so pleased you really enjoyed your stay. 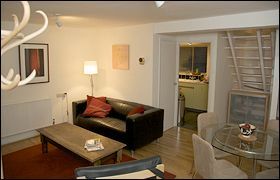 I agree that the flat is excellent value for money and ideal for families or sharers.We've done a few improvements since your recent stay and hopefully it's looking less tired now.I hope you choose to stay again on your next visit, and thank you for leaving the flat in such good order. Notting Hill is an affluent area in London, England, close to the north-western corner of Kensington Gardens, in the Royal Borough of Kensington and Chelsea. It is a cosmopolitan district known as the location for the annual Notting Hill Carnival, the setting for the 1999 film Notting Hill starring Julia Roberts and Hugh Grant, and for being home to the Portobello Road Market. Notting Hill has a contemporary reputation as an fashionable area.It's known for its very attractive terraces of large Victorian townhouses, and high-end shopping and restaurants.